Pigs can be unpredictable and some pigs can even get mean especially when piglets are involved. Make sure you always check the fence line for any panels that may be loose or any digging from the pigs that can lead to an escape. A small amount of pigs and a small pen is sufficient for a beginner. Building a pig pen is relatively simple, especially if it is only going to house a couple of sows. Pig pens should be designed to incorporate a few necessary ingredients, a place for the pigs to get out of the elements, a place to feed them and if space is limited just a small area for them to play, relieve themselves and root around in. Build the pig enclosure large enough to incorporate all the necessary areas by using at least eight-foot panels that can be easily purchased from a livestock farm equipment supply. The panels need to be large enough so that a portion of them can be buried, pigs like to push against fencing and root and the panels should be buried at approximately one- to two-feet deep to keep them from escaping their enclosure. Sink metal posts about every three to four feet to secure the panels depending on the size of panels purchased, ask the farm supply people for help with choosing the right amount of panels and posts for the size enclosure you are going to build. Use zip ties or wire to attach the posts to the panels, secure the ties on the outside of the enclosure to insure the pigs are not hurt by anything sharp. Make sure the corners are securely fastened and allowing the panels to weave together and then placing the post inside the corner and attaching it firmly to both corner panels will be sufficient. Make sure the gate opening fits snugly, since if there is too much room the pigs will dig their way out eventually. The farm supply people can help you find the easiest gate to securely fit with the type of fencing you have chosen. Make sure the gate has a sturdy and secure latch so that the pigs are not able to push against it and escape. The gate should be very close to the ground and preferably so low that it may be a little difficult to pull open when brushing over thick grass. Gates can always be reinforced as well with a large piece of timber placed against the bottom and secured when the gate is not being opened. Set the pig pen up in a flat location and one that offers some shade if possible. Some people actually set up their enclosures using concrete slabs and sinking their fencing into concrete as well however this makes the pig pen much more expensive and not able to be moved should a time arise that you want to move the pig pen. 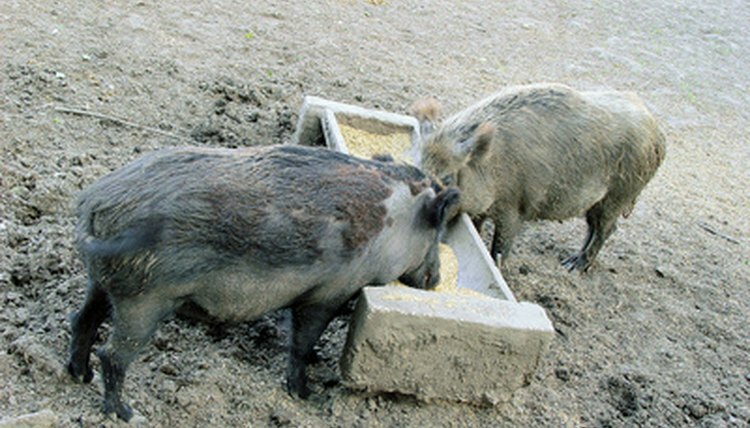 Even though slabs aid in the cleaning process, pigs like plain grass and dirt. Build a simple three-sided enclosure that the pigs will be able to get out of the inclement weather. Pigs can be affected by harsh temperatures and often seek shelter in which to stay warm and dry. Fill the shelter with fresh beds of straw. Place the troughs away from the area designated for reliving themselves and keep fresh water available. Feeding the pigs once a day is sufficient, pigs are easy to feed. They eat corn and a mixture of leftovers. Place straw in not only the bedding area but toss it over the area they use for relieving themselves it will absorb odors and keep the area clean between enclosure cleanings. Clean the pig pen as often as possible to keep the pigs free of disease and keep the odors to a minimum.